I don’t understand a part of one of Jessica’s patterns, how can I get help? Due to the amount of messages Jessica receives daily, it’s quite unrealistic to be able to answer every email and question. So sorry! Because of this, she has created a Facebook page (The Hook Nook Crochet Group) where Makers can post photos, ask questions, and so much more. Complete with a team of amazing admins and thousands upon thousands of members, it’s our little happy spot of encouragement and guidance! Please reference this group for any questions you may have. Can I sell items that are made using your patterns? Yes! Absolutely! However, I do ask that you do not use any images posted by The Hook Nook, unless you have received permissions directly from Jessica. Please always remember to reference The Hook Nook as the pattern source for your item(s). Can I share your pattern(s) that I purchased with my friend/family member? No, please do not do that. As stated in each listing, the person who has purchased the pattern is the only person that should be viewing the PDF. If your friend or family member is interested in creating that same piece, please direct them to any of the platforms to purchase their own copy (Etsy, Ravelry, Love Crochet, etc). Please remember that sharing the pattern is considered theft and just really disrespectful to the pattern designer. I spotted an error in one of Jessica’s patterns. How can I let her know? Oh no! Thank you for catching it!! Please send the details to Megan (THN Customer Service Representative) so the appropriate measures can be taken. You can email her at: thn.takeover@gmail.com. I contacted Jessica with a question about one of her patterns but haven't heard back. How do I get help? Jessica is a full time mom and wife who receives MANY messages per day. It is highly unrealistic for her to respond to each message in a timely manner. If you would like help on one of her patterns, please join the Facebook group (The Hook Nook Crochet Group) and post your question there. With 9k+ members, you're sure to get help very quickly. I want to offer certain products in my shop using The Hook Nook's patterns. Can I use one of the stock photos until I am able to create my own product? Thank you for enjoying the designs and wanting to offer those items in your shop! What a compliment! However, please do not use any stock photos in your shop. If you want to offer a certain item but need to receive an order for it first prior to purchasing the pattern, you may reference the name of the pattern and a link to the pattern listing but please still do not use any stock images as your own. I ordered a pattern from The Hook Nook's Etsy shop but can't find where to download it. Help! Once an Etsy purchase is made, you should receive an email from Etsy to the email you have on file with Etsy. If you do not receive this email, you can access the files by clicking in to your Etsy Purchases. This section is available by clicking on your name/photo on a computer/tablet. You cannot access the download files through the Etsy app. You MUST use a computer or tablet. How can I get a new PDF? Please remember to save your PDF's at time of download. It helps to keep your patterns on a zip drive or saved in your email in the event that your phone/computer/tablet or any other electronic device becomes defective/lost/stolen/etc. If, for any reason, you do need to access another PDF of a previous purchase, please send an email to Megan (THN Customer Service Representative - thn.takeover@gmail.com) with your order number/purchase receipt copy, which site you placed your order and a new PDF will be sent. But PLEASE keep the PDF saved in your email. We receive a lot of messages/emails per day and please know that it may take a few days for your copy. I would love to contribute to The Hook Nook Life blog, how can I sign up? Thank you for your interest in contributing to our blog! We always love showcasing the talents of those within our Maker community and being able to do so via the blog is such a wonderful opportunity for everyone involved. Throughout the year, we will occasionally host “Maker Calls” where we will ask for post submissions to feature on the blog. Each Call may be different than the last (requesting specific seasonally appropriate material), so be sure to keep an eye out for the next call and what kind of content we will be looking for! I applied to a Hook Nook Maker Call and wasn’t accepted, what’s next? Thank you so much for taking the time to apply to our Maker Call! We receive an incredible amount of applications and can only fit so many posts in our calendar. Some content is not chosen to be featured due to photo quality, originality of suggested post, repeat topics, and many other reasons. We try very hard to feature Makers of all levels and, just like me, sometimes practice makes perfect. If you were not accepted for a specific Maker Call, PLEASE feel comfortable to take any given tips from our team to “clean up” your post and try again! We want to make sure that all content featured on our blog is high-quality, intentionally and uniquely created and fit our mission. If I would like to contribute to the THNLife blog but want to use my content elsewhere as well, can I do that? Or is it exclusive? The team here at THNLife are firm believers in allowing Makers to use their content in anyway they see fit. We do not ask for copyrights for patterns or verbiage or anything of the sort. You can apply knowing you have the freedom to use the finished content however you see fit, once the post is live on the blog. Please know that we do ask that content remain private and secret until official post date. I’d love to contribute a free pattern to the blog, but want to offer a beautiful templated version, but am unsure of how to do that. Do you have any recommendations? Thank you so much for your willingness to contribute such a labor of love! We would be happy to feature your quality pattern on the THNLife blog and do not require it to be templated. However, if you would like to take your pattern to the next level, we are happy to template the pattern for you. We do ask for a fee for this service. Please email Jen (hello.thehooknook@gmail.com) for more information. I would love to apply to be a featured Maker for the THNLife blog but am not sure I am good enough. Are there certain requirements to participate? have a sense of personal style and are able to create one-of-a-kind projects while also able to explain the creative process to others in an easy-to-understand way. Makers may also contribute original DIY projects, patterns, inspirational shares or anything else the Maker finds inspiration for that is relative to our Maker community. are tech-savvy. We ask that each Maker has a personal or business account on Facebook and/or public Instagram account. Maker must be able to write a detailed blog post sharing their work in a way that inspires others and are able to photograph their projects clearly and beautifully. We also ask that the Maker is able to communication through email in a timely manner. is responsible. One of the biggest things we ask for is that, if chosen, each Maker is able to complete their project/post/photography within their designated time frame and can send in content by their assigned deadline. I would like to collaborate with Jessica/The Hook Nook. How can I contact her? Jessica LOVES working with other Makers, brands and companies! Please send your collaboration proposal to contact@thehooknooklife.com and she will be in touch to discuss her availability. I would like to send Jessica some products I sell/offer for her to share in her Instagram stories. How can I arrange for that? You are so generous, thank you! Please feel free to email Jessica (contact@thehooknooklife.com) to arrange for this. Sharing your product(s) in @the.hook.nook stories is always FREE and we are so happy to share the talents and products of the Makers in our wonderful community! I would like to send Jessica some products I sell/offer for her to share on her Instagram feed. How can I arrange that? Thank you so much for your generosity! At this time, Jessica enjoys keeping her feed more inspirational as opposed to a promotions platform. However, you may still send the item(s) to Jessica for her to feature in her story, at no charge. Please contact Jessica (contact@thehooknooklife.com) to arrange for this service. I would like to schedule a giveaway with Jessica on her Instagram/Facebook. How can I set that up? This sounds like so much fun! We love to host giveaways periodically and thoroughly enjoy involving all kinds of Makers/brands/companies! Please feel free to email Megan (thn.takeover@gmail.com) to find out more about the current schedule and what to expect. Does Jessica offer Take Overs on her Instagram or Facebook? At this time, there is no Take Over option for the business profiles, however, you CAN take over the Facebook group (The Hook Nook Crochet Group) for a small fee! Your take over lasts for 24 hours and you may introduce yourself, your business, exclusive coupon codes for the members of the group, and you can even go live within the group to connect with the audience even more! If interested, please email Megan (thn.takeover@gmail.com) to find out more! Where do you buy your yarn? Jessica is a self-proclaimed “non-discriminatory” Maker. She loves to use yarns from all sorts of places ranging from her local craft stores (JOANN, Michael’s, Hobby Lobby, etc), local yarn stores, indie yarn dyers, private label yarn brands, international yarn brands, limited edition fibers, etc. Many of the yarns featured across THN platforms can come from a myriad of places around the world. She tries to either note in the caption or tag the company/brand in the photo for credit. What hooks do you like to use? 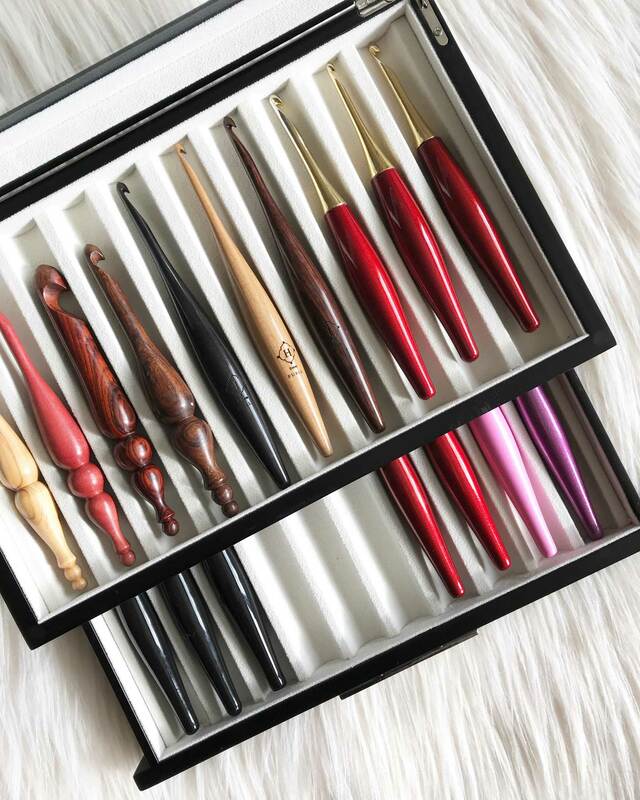 Jessica exclusively uses Furls Crochet hooks due to their scientifically designed shape and high-quality materials. Her favorite style of Furls Crochet hooks are from the Odyssey line as she prefers metal-tipped hooks for their gliding ease. Read the full review by Jessica here. Do you sell your finished items? Can I make a custom order? At this time, Jessica does not sell her finished items nor does she accept custom orders. We apologize for any inconveniences, but she has found a calling for pattern writing, blogging, photo shoots and typically works on several collaborations throughout the year which all require time and attention. I want to write patterns, do you have any tips or suggestions on how to get started? How exciting! Pattern writing can be fun and confidence building as well as quite frustrating. Keep an eye on the blog for posts discussing this topic. I would like to translate one of Jessica’s pattern to another language, can I do that? We appreciate you wanting to expand the reach for The Hook Nook patterns! Unfortunately we cannot allow the patterns to be privately translated and shared as it goes against copyright laws. If you would like to translate a specific pattern, please email Megan (thn.takeover@gmail.com) to request permission. We would love to share the translated PDF on our blog and in our pattern listings as optional downloads. You may include your contact information and any direct links to your page for proper credit and we will be happy to include that information in the blog post. I love your website! Who can I contact to have them help me create one? 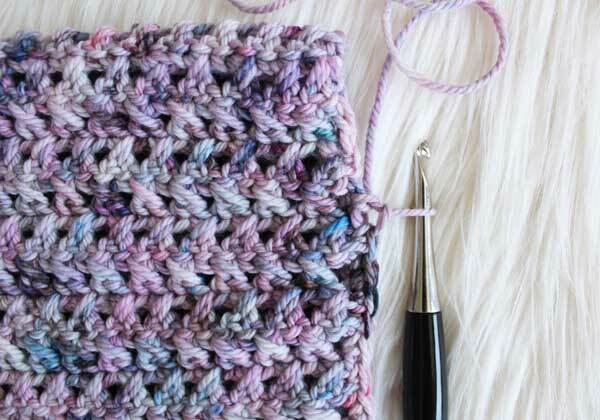 I saw a photo Jessica posted online and want to know which stitch she used. How can I find that out? Many times Jessica posts photos of upcoming patterns or collaborations so the particular stitch used or stitch sequence may be unavailable until the release. Please be patient until it is available! Also, at times she loves to play around with stitches to see how yarn works up and does not write up patterns for every sample created. As frustrating as it may be, sometimes this information is unavailable as the sample is used solely for swatch or photo purposes. We apologize for any inconvenience. Jessica Carey / The Hook Nook participates in a variety of Affiliate marketing programs. Any links to those sites may earn advertising fees. Jessica Carey is a participant in the Amazon Services LLC Associates Program, an affiliate advertising program designed to provide a means for sites to earn advertising fees by advertising and linking to amazon.com. The Hook Nook / THNLife Blog shares content created and submitted by individual Makers from around the world. We focus on sharing original, one-of-a-kind content as given to us by voluntary contributors. All submitted content’s copyrights are entirely owned by the contributing Maker. In the event of content copyright violation, please contact us with details and proof of violation. Please also contact contributing Maker to discuss further. Contributing Maker contact information can be found in their featured post. All content on this site in its entirety is the sole property of Jessica Carey of The Hook Nook, with the exception of contributed blog content from Makers.